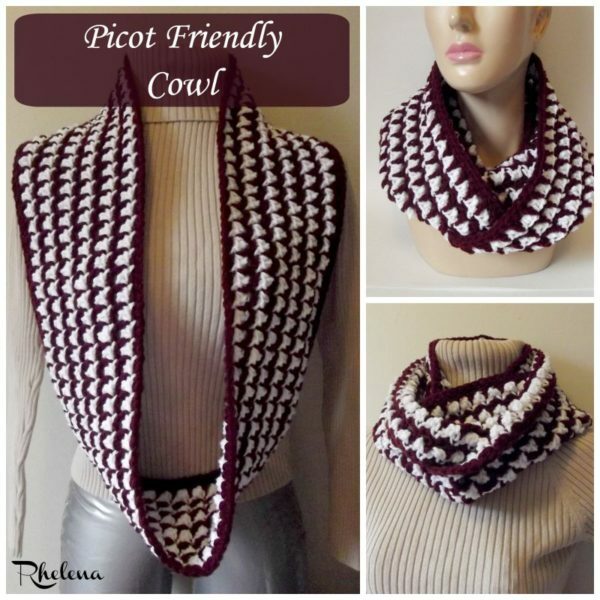 The picot friendly cowl is mindless to crochet and stylish to wear. It has a nice color combo, which you can customize to match your outfit. The size of the cowl is also easy to adjust, as the stitch pattern is only a multiple of two. And that means you can use any yarn and hook size that you have on hand. 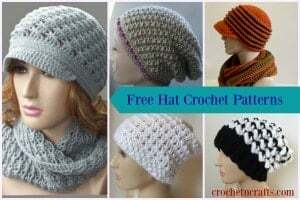 More patterns are coming in the picot friendly series, including a hat and bag, and who knows what else. So stay tuned for those. Gauge: Approximately 3.5″ over 5 stitch repeats. Carry yarn up at each round. Or, for a clean seam, you can fasten off after new color is joined, or fasten off and begin next round with a standing crochet stitch. With CA, Loosely Ch 150, or any multiple of 2; join with sl st in first ch being careful not to twist chs. Rnd 4: Ch 1, (sc, picot) in same st as join and into each dc st around; With CA, join with sl st in first sc. Rnds 5-13: Rep rnds 3-4 ending rnd 13 with rnd 3 and omitting the color change at last round. Rnd 14: Ch 1, sc in same st as join and into each st and ch around; join with sl st in first sc. (150 sts) Fasten Off. Last, but not least, Thank you so much to my awesome testers for pulling through for me on this one.